Cotinus coggygria, syn. 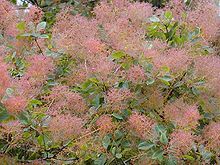 Rhus cotinus, the European smoketree, Eurasian smoketree, smoke tree, smoke bush, Venice sumach, or dyer's sumach is a species of flowering plant in the family Anacardiaceae, native to a large area from southern Europe, east across central Asia and the Himalayas to northern China. It is a multiple-branching shrub growing to 5–7 m (16–23 ft) tall with an open, spreading, irregular habit, only rarely forming a small tree. The leaves are 3–8 cm long rounded ovals, green with a waxy glaucous sheen. The autumn colour can be strikingly varied, from peach and yellow to scarlet. The flowers are numerous, produced in large inflorescences 15–30 cm (5.9–11.8 in) long; each flower 5–10 mm diameter, with five pale yellow petals. Most of the flowers in each inflorescence abort, elongating into yellowish-pink to pinkish-purple feathery plumes (when viewed en masse these have a wispy 'smoke-like' appearance, hence the common name) which surround the small (2–3 mm) drupaceous fruit that do develop. It is commonly grown as an ornamental plant, with several cultivars available. Many of these have been selected for purple foliage and flowers. The species and its cultivars 'Royal Purple' and 'Flame' have gained the Royal Horticultural Society's Award of Garden Merit. The wood was formerly used to make the yellow dye called young fustic. Macrofossils of Cotinus coggygria from the early Pliocene epoch have been found in Western Georgia in the Caucasus region. ^ "European smoketree". Natural Resources Conservation Service PLANTS Database. USDA. Retrieved 17 January 2016. ^ "RHS Plant Selector Cotinus coggygria AGM / RHS Gardening". Apps.rhs.org.uk. Retrieved 2012-10-01. ^ "RHS Plant Selector Cotinus coggygria 'Royal Purple' AGM / RHS Gardening". Apps.rhs.org.uk. Retrieved 2012-10-01. ^ a b "RHS Plant Selector Cotinus 'Flame' AGM / RHS Gardening". Apps.rhs.org.uk. Retrieved 2012-10-01. This page was last edited on 14 July 2018, at 23:11 (UTC).